Much of what’s in this document comes from professional relationships with leaders like you. We’ve had the immense pleasure of being deeply engaged in the culture of outdoor science programs and trying to figure out how to make outdoor science the best it can be. The information here was collected over a three year period from over 70 programs across the U.S. and even a few international programs. 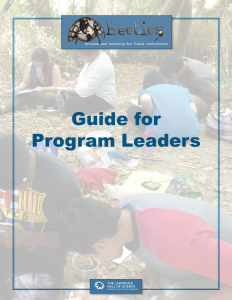 The leaders of these programs have been using BEETLES resources with their staff in a wide variety of ways and contexts. They’ve had exciting successes, unexpected outcomes, and some bumps in the road and have given us thoughtful, honest feedback about all of it. The advice, guidelines, and recommendations shared over the following pages come from hundreds of casual conversations, emails, formal interviews, focus groups, and many, many surveys thoughtfully submitted by our field test sites and partners. We combined those responses with our own delightful first-hand experiences observing programs, teaching in programs, working and musing with hundreds of you about how to improve our field, and with all the lessons we could learn from pouring over 25 years worth of research on science and environmental education, cognitive science, professional learning, language development, equity and inclusion, and organizational capacity building. As we’ve observed programs shifting their outdoor science programs toward more student and nature-centered instruction, we’ve found patterns in their challenges and successes. And we’re pleased to share them here. Throughout this guide, we‘ve based our recommendations largely on the experiences and anecdotes of leaders in the field and then generalized from them while citing research that validates the approach and moves the anecdotes toward becoming a principled theory of action. Our goal is to elevate the field of outdoor learning by basing our improvement efforts on the latest evidence from research, while at the same time retaining the informal and spirited exuberance that continually draws us back to this community.